Ya know, I really must be deranged. No, strike that ... I must be a crow because I am CONSTANTLY distracted by all the NEW! SHINEY! things. Case in point: I have DD#2's 'inspired by Jane Austin' purple quilt to work on. It's been stalled for quite a few months (er .. dang near an entire *year*), as I have worked on other, more immediate projects. 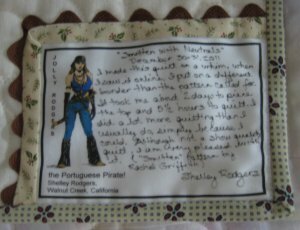 When those projects were completed, instead of returning to Jane, I became distracted by piecing and by quilting those NEW projects. One distraction is the "Oh My Stars quilt-a-long". The block reminds me of Card Trick (in a optical-illusion way) and very cute. I pulled a number of coordinating neutral prints from my stash to give the Smitten pattern a go. I found a Fossil Fern almost-white but with subtle touches of pale color that complimented the neutral prints wonderfully. I wasn't sure that I had enough for the entire pattern, as designed, but I would simply make as many as I could. Dang! This is turning out doggone cute! So, I'm happily hacking and slashing away at my little pile of stash fabrics. I run out of some of the 'focus fabric', but that's OK because it's a scrappy quilt and adding more fabric in the same color family works out well. I've ended up with (12) twelve-inch blocks. The pattern calls for 3 slab-o-borders to finish the quilt. It's cute and I've certainly done my share of slab-o-borders, but I really like borders to do something different other than just "be there". 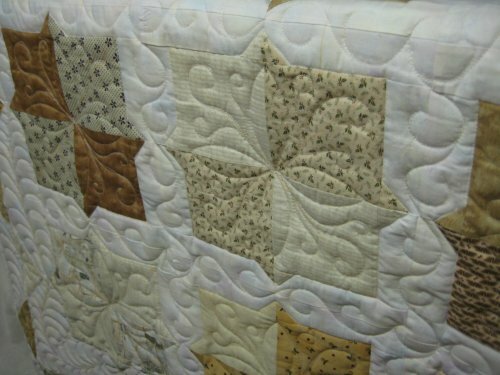 To enable me to actually SEE what a border might look like with the Smitten blocks, I drew the quilt in Electric Quilt. If you don't have EQ, I urge you to put it on your Wish List. It is such a wonderful design tool, even if you only use just the basic funtions. 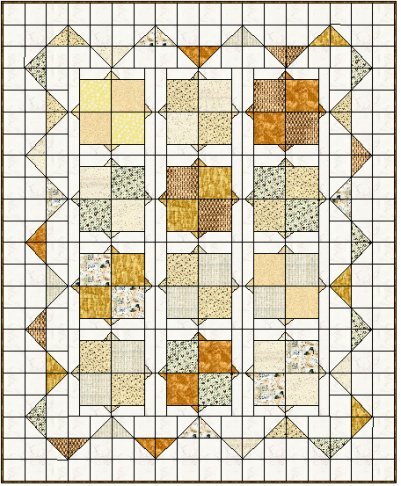 I looked through my reference books and found a pieced border that seemed to be compatible with the Smitten block in "Treasury of Patchwork Borders (Full size patterns for 76 designs)" by Elizabeth Nyhan. (It's Border 11). 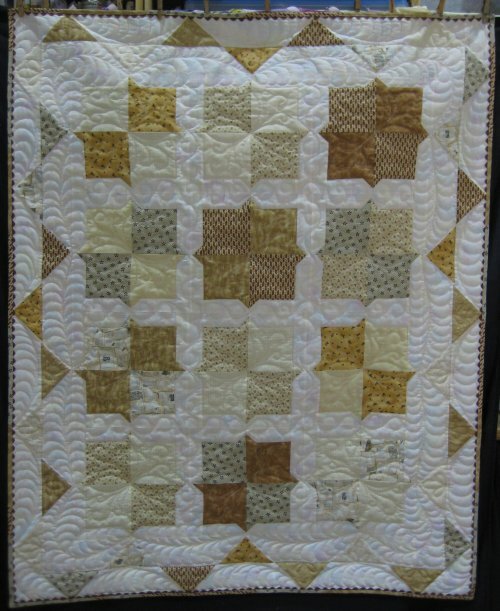 I did try other pieced designs but liked this one the best. The problem? The stash fabric I am using for the background of the blocks, while sufficient FOR THE BLOCKS, is rapidly running short for this new pieced border ... *eventhough* I am being very frugal in my cutting. At 2am this morning (12/28/11), I officially ran out of the background fabric. I still need (4) 3-1/2" squares. Oh, let me say that running out of the background fabric was *entirely* my fault. Remember, I changed the outer borders from what the pattern specified. Fortunately, I *saved* all the leftover cut-offs and am making more background fabric by piecing these bits together. So, there will be a few more seams than there should be. ::shrug:: Today, I'll finish creating my fabric for the 3-1/2" squares and the top will be finished. from Cathy (quiltycat) in southern California; "... You know, if you get that done in the next day or so, you might go ahead and finish it, while you wait for your thread arrival... (ducking and running...) -Cathy (Yeah, I can be a troublemaker...)"
I must have actually PAID ATTENTION to what Quilty Cat said because as I began doodling my quilting designs, I kept thinking that I really ought to quilt it *now*, when the design is fresh in my head. Doodles are great for remembering the overall design, but if there is any tricky manuevering from motif to motif, those sorts of subtleties get lost over time. On the afternoon of the 30th, I couldn't stand it. :-) I loaded Smitten with Neutrals onto Lizzie ... I use extra-wide muslin (pre-washed) for backings. I like it because it's seamless, I can buy a bolt of it at Joann's with a 50% (or 40% discount coupon), it gets softer with laundering, it's traditional .. but mostly because ... it's inexpensive! With the cost of quilting fabrics inching upwards, it's a major expense just to buy the fabrics for the front of the quilt. These days, I really can't justify putting the pretty quilting fabric on the back as well, when in reality, no one sees the back. As for the batting, I'm always on the look out for a higher loft batting that is drapeable and is cuddly. I've tried LOTS of different battings. I know that I don't care for Warm-n-Natural. It's certainly an excellent batting, but I don't like how *flat* it is. 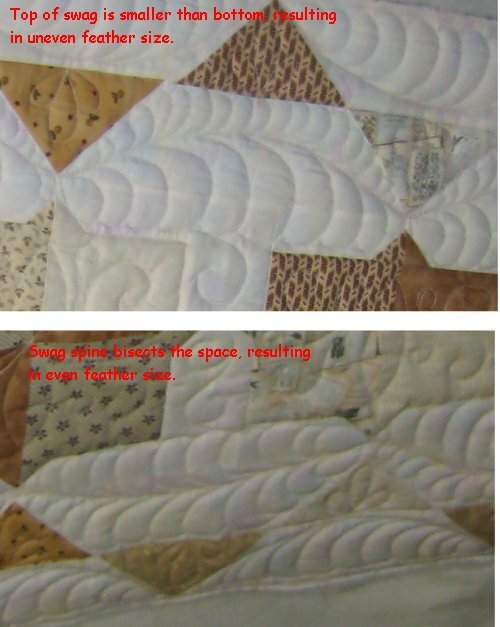 ... quilting purists, turn your eyes away right now! 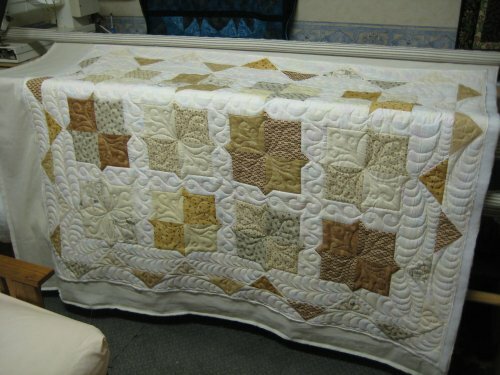 For this quilt, I used "Soft-n-Crafty" extra-loft batting (polyester) from Joann's. Yup! I used *polyester* batting from Joann's. And ya know what? It's awesome. After I laundered the quilt, it came out fantastically soft, VERY drapeable and highlighted all the fancy quilting that I did. Launders well and dries quickly. Yup, this stuff is a keeper!. 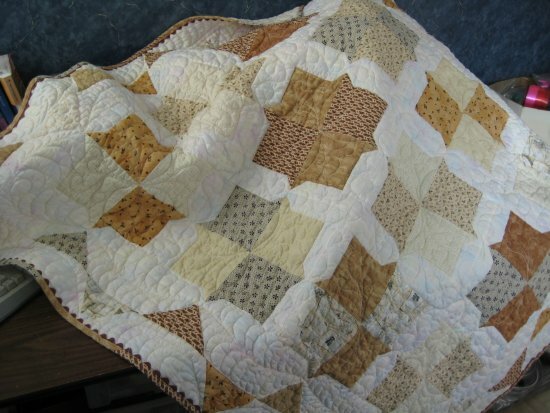 As for the actual quilting .... this quilt was done a little differently from what I usually do. At 12", these blocks are somewhat larger than I usually make and that presented a dilemma for me. I wanted to do feather swags in the border. I like to use a template to stitch the curved spine because I get a lovely *consistent* curve for every swag. Unfortunately, the 12" blocks required a size and shape template that I didn't have. I discovered that a 16" diameter circle would give me part of a nice curve, but I couldn't FIT the entire circle template in the workspace that I had on Lizzie. Oh dear .. what to do? what to do? The only solution (that I thought of, which was doable *right then*) was to chalk the spine onto the quilt top using the circle template as a guide and then .. ::Gulp:: stitch over the drawn line freehand. I knew my freehand isn't the best for precise designs like this .. but .. it was the best solution I had. The first feathered swags I did, I kinda mis-judged where to put the spine. As a result, the feathers on the "top" of the spine are much smaller than the feathers on the "bottom" of the spine. By the time I realized it, I had already completed 2 swags and didn't want to rip anything out. For the rest of the swags, I measured where the middle of the space was and put the spine there, so the feathers on either side would be of more-or-less equal size. When I looked at the completed quilt, I'm not quite sure if I should have actually put the spine slightly more than half-way up the space, but not as far as I did with the first swag. I'm not sure if having equal sized feathers is a more attractive design than having slightly unequal size feathers. I think I like the more arched appearance of the spine of uneven feathers sizes but I'm not sure how to get that arch without having uneven feathers. Or maybe I need to exaggerate the arch and emphasize the uneven feather size?? This is one of those artistic design aspects that I am totally ignorant of. I'm getting better with quilting feathers! Although not every feather swag is perfect and some of the feathers are a tad dicey, I'm very, very pleased with the overall effect. It's very true that 'practice makes perfect' ... or at least 'better'. 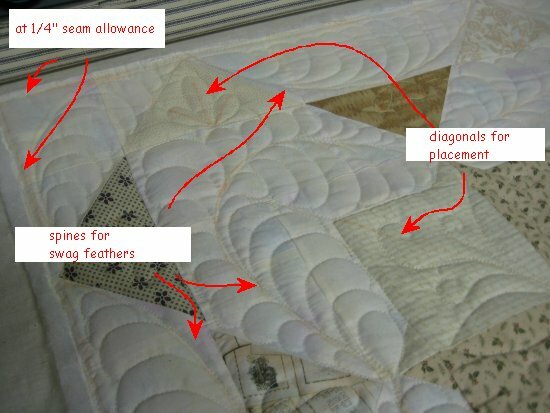 :-) I love quilting feathers. 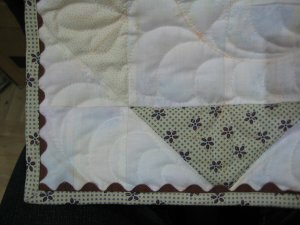 I'm particularly pleased at learning how to stitch the inside corner ... you mark the diagonal and use it as a faux edge. I also used chalk to mark other significant points for me to pay attention to. 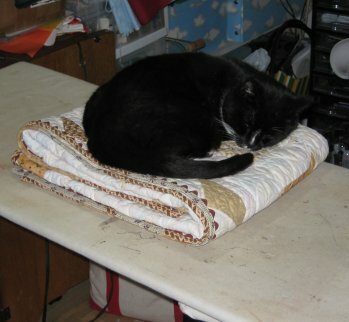 I usually forget when quilting borders and quilt right up to the edge. This is OK when you have an edge-to-edge design but for this feather swag, I needed to remember to STOP before the seam allowance. So, I chalked where the 1/4" seam allowance was. I also chalked the diagonals on the Smitten blocks to help with motif placement and I chalked segments in the sashing to help me keep the width of the motifs more-or-less consistent. 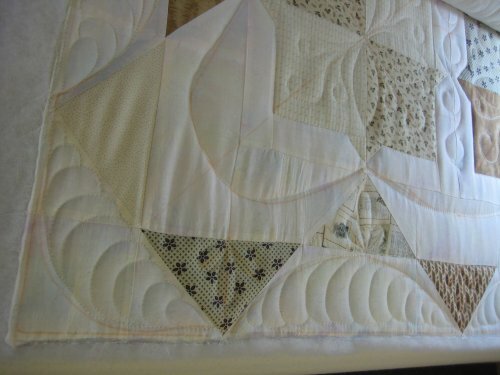 What I didn't chalk in the sashings was the height of each motif and as a result, the height of the swirls vary. Not a LOT but some. Live and learn. The blocks themselves got a 4-petal continuous curve along the seams and a 3-piece curly-Q spray between the petals to hold down that space. For the first curly-Q sprays, I deliberately stitched the return path as a ribbon ... because I knew I couldn't back-track exactly on the orignal stitched line. When I looked at the completed first row, I wasn't 100% pleased with the look; it looked a tad "messy". For the remaining blocks, I did a gentle wandering on the return path and that turned out so much nicer. I used one of my favorite motifs for the sashings: the curly-swirly! 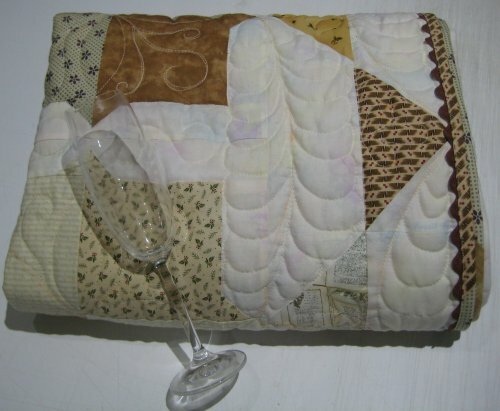 This design comes from master quilter, Carla Barrett. I used the basic design, although she has LOTS of variations. Finally the quilting was finished! I was really, REALLY pleased with my efforts. :-) The actual quilting was about 5-l/2 hours, done over two days. The double fold bias binding had been previously sewn, the label was ready also. But I had one more design feature to incorporate! My neighbor came over to visit. I had just finished Smitten with Neutrals and was showing it off to her. When she saw it hanging up, she literally *gasped* and asked if she could buy it. It turned out that she has been (slowly) redecorating her house. There is a short hallway that leads from the living room in the front of the house to the kitchen/dining area in the back. The colors I chose for Smitten was EXACTLY the colors she was looking for in an "art work" to hang in that hallway. She said it was perfect and she would be so honored to be able to buy it. Well then. That put me in a rather awkward position. I was just basking in the glow of All Those Feathers and being rather pleased with myself. I hadn't thought of selling it. I certainly hadn't kept track of the cost of making it. But, because she just really, *really*, REALLY liked it, I gathered my information together .. the amount of fabric I used, the price I would have asked for the quilting if it had been a commissioned piece, the binding ... and a certain amount for my labor ... and came up with a figure that I thought would be reasonable for me to ask. And then .. what could I do but sell it to her? So, it was with somewhat mixed emotions that I exchanged my newly finished quilt for some money.